Editorials from Theslowlane: Is the radio audience shrinking? Is the radio audience shrinking? 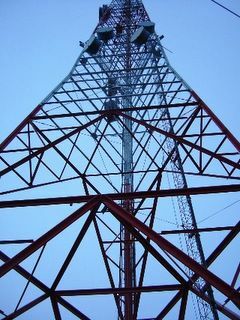 I recently read an article about broadcast radio suffering from the competition of Ipod's, Internet and Satellite Radio. Many local broadcasters are just relays for some regurgitated national talk show that's carried on hundreds of "look alike" stations. Might as well get the network feed directly off a satellite. Why bother having local transmitters to repeat the same thing? 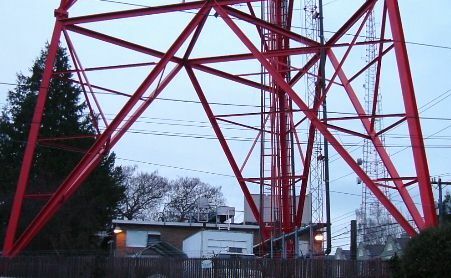 Stations who originate programs in their local studios may not be as seriously hurt by these changes as the network clones. The local station can still have a niche when it is based on the local community that surrounds the station. If there are too many redundant outlets for a national network, in one area, maybe some of them should go off the air. Clear the crowded AM and FM dials for more interesting things. 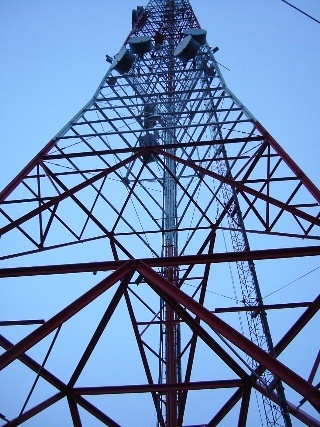 Picture, above, is looking up at one of the Queen Ann Hill Radio TV towers in Seattle. I am not sure which stations are on which towers. I walked near those towers when I was last in the city. It's KIRO, KING and KOMO on Queen Anne. On Captiol Hill, it's KTWB (22), KSTW (11) and KUOW, among others. :-) Neat pictures.